Durban, on the east coast of South Africa, was incorporated into the eThekwini Metropolitan Municipality in December 2000, following which new municipal symbols were adopted. Durban originally used an armigerous flag based on Arms registered by the Bureau of Heraldry on 17 October 1980. These were based a design that has its origin when the town was made a Borough in 1854. Application for a grant of arms was made to the College of Arms (London) in 1906 where certain suggestions were made which were rejected by the Council and as a result no grant was issued by the College of Arms. Following the re-organisation of local government in South Africa in 1996, Durban used a flag based on its municipal logo which comprised a dark blue field, in the centre of which is a representation of the dome of the Durban City Hall in light blue with a white outline. The City Hall is the seat of municipal government and was built in 1910 and is almost an exact replica of the city hall of Belfast in Northern Ireland. Blue is the corporate colour of the municipality and symbolises the city's importance as a tourism destination based on its coastline and beaches. This flag was used until 2000 when Durban was incorporated into eThekwini Metropolitan Municipality. The city of Durban was founded in 1835 by Captain Allen Gardiner, who named the settlement after the Governor of the Cape Province, Sir Benjamin D'Urban (1833-1837. The settlement never prospered, and five years later a new town was founded in the, then, Republic of Natalia, which bore the same name. The British occupied the town in 1842 following which it started to develop. 1855 the council needed a seal for the new city and opened a competition for its design. The new seal showed an image of the town and the bay, with a five-pointed star. A new seal was needed in 1882 and the design showed the arms of Sir Benjamin D'Urban, quartered with those of Sir Benjamin Pine (Governor of Natal, 1850-55). The arms were poorly drawn with thick lines over the borders and the quarterings. The aloe plant and star were used as crest. This seal was in use until 1936. In the meanwhile the stationery of the council showed the same arms since 1912. To the arms on the seal a motto was added, Debile principium melion fortuna sequetur, or Better fortune follows a difficult beginning. In 1913 the helmet and mantling were added. In 1936 these new arms were also cut into the new seal of the city. 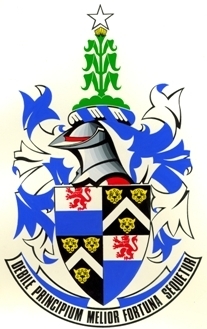 Even though the arms are widely used, they are never granted by the College of Arms. The city has applied to grant these arms, but the arms were refused by the College. The main reason is that the position of the two arms indicate a marriage between the two families, which obviously is not the case for Durban. Secondly, during the decades there has been some debate whether the D'Urban arms were actually the correct arms. This matter was not resolved and the city never attempted to change the arms. MOTTO: DEBILE PRINCIPIUM MELIOR FORTUNA SEQUETUR (Better fortune will follow a weak beginning). The flag of the Durban Metropolitan Police Service has a dark blue background, defaced in the centre with the badge of the Service. The badge has the municipal logo, namely a representation of the dome of the Durban City Hall in light blue with a white outline, surrounded by a ring of light blue, fimbriated in white, containing the words DURBAN METROPOLITAN POLICE SERVICE in white, all of which is superimposed in the centre of a silver (grey) and black six-pointed rayed star.